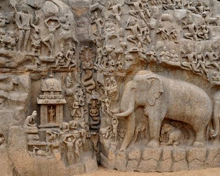 The temple city of Mahabalipuram (also known as Mamallapuram) is the site of some of the greatest architectural and sculptural achievements made by the Pallava rulers in ancient India. Located some sixty km from Chennai, the capital of the south Indian state of Tamil Nadu on the Bay of Bengal, the temples of Mahabalipuram represent one of mankind's most amazing and enduring architectural achievements. The structures one sees at Mahabalipuram today, are the surviving remains of a wonderful religious, social and administrative metropolis that once severed the religious capital of the Pallavas. Mahabalipurum in the state of Tamil Nadu was designated a UNESCO World Heritage Site in 1984, and a visit to this once-thriving port city of the Pallavas, who held sway over much of south India between the 4th and 9th centuries A.D., is a sure cultural highlight of any tour in India. Named after its founder, the great Pallava king, Mamalla, "the Great Wrestler," the tourist town of Mahabalipurum is a grand spectacle of the South Indian temple architecture which received great impetus during the Pallava reign. The Pallavas, who ruled to the region south of Krishna - Tungbhadra, were contemporaries of the Rashtakutas. The origin of the Pallavas is shrouded in mystery. However it is certain that Simhavishnu Avanisimha was the real founder of the Pallava dynasty. He ascended the throne in 575 AD. 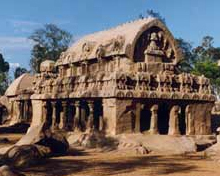 His son Mahendravarman, one of the prominent rulers of the Pallava dynasty, is credited with introducing the cave style of temple architecture for which Pallavas are known all over the world. Under his instructions, some of the finest rock-temples at Mahabalipuram were hewn out. Nandivarman II was one of the greatest rulers of the Pallava dynasty. Arjuna's Penance is the major highlight of the temple architecture. How to reach Mahabalipuram By Air - The nearest airport from Mahabalipuram is Chennai. Visitors can get flights from Chennai for almost all major destinations in the country and abroad. How to reach Mahabalipuram By rail - The nearest railway station, Chengalpattu in the state of Tamil Nadu, is around 30 km away from Mahabalipuram. Trains for Chennai and several other major destinations in South India can be found from here. 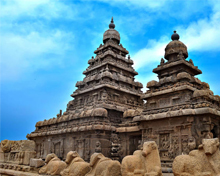 How to reach Mahabalipuram By Road - Mamallapuram is well connected to major cities of India by road. The place is well connected to Chennai, Pondicherry, Tirukkalikundram (Pakshithirtham), Kanchipuram (65 km) by road. Visitors can find various kinds of accommodation options, ranging from luxury to budget hotels in Mahabalipuram. You can find several beach resorts at Mahabalipuram. It is advisable to have reservation in advance in majority of cases.